Published on 2018-01-06 in maps, politics and willingham. After the Civic Affairs Committee Meeting, groups representing the Parish Councils of Over and Willingham arranged three meetings over the Christmas period to agree a compromise (see posts passim). The first meeting was an outdoor walk over the current and proposed boundaries, so everybody knew what we were talking about on the ground. This was amicable and not unpleasant, if slightly damp underfoot. The next meeting was at Willingham Parish Council offices, and took place after Over had their next Full Parish Council Meeting. It was a very short discussion, because Over had voted unanimously not to change the border, because 400 years. So much for compromise. The final meeting was cancelled. So, back to the Civic Affairs Committee with low expectations. I didn’t attend this time, as it was held during the working day, but the astonishing result was a decision to move the border to the green line, minus a couple of fields to the south (the red hatched fig-leaf to the committee shown on the map). An astonishing eleventh hour outbreak of sanity. It’s not a completely done deal as the decision of the Civic Affairs Committee is only a recommendation to the Council. We will have to wait for the 25th January Council meeting for the rubber stamping to seal the deal – unless more politics intervenes. Published on 2017-12-08 in maps, politics and willingham. Last evening I attended the South Cambridgeshire District Council’s Civic Affairs Committee Meeting as a member of the public, albeit wearing my Parish Council Planning Committee Chairman’s hat. Under consideration was a petition from businesses and residents in a portion of Willingham village which, for historical reasons, is actually across the border and in the neighbouring village of Over, although it adjoins Willingham and is separated from Over by more than a mile of open countryside. It’s a good job there was no flammable liquid to hand because self-immolation was becoming an increasingly tempting option as the evening wore on. This was essentially a single agenda meeting and it took 2 1/2 hours. As a member of the public, I was not allowed to speak. The people and businesses in the area want to be in Willingham. Therefore, according to the Guidance, they should be in Willingham. 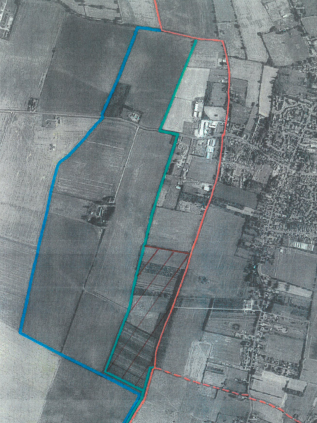 Over Parish Council objects to moving the boundary. Nobody knows why, and they didn’t say. The best I could glean was because 400 years. Various District Councillors are also against it, and it is even harder to understand why. They never addressed the point, but did argue themselves into corners on several occasions. One Councillor briefly raised the question of cost, but not what the cost related to – it seems the cost of debating this must now dwarf the cost of actually changing the boundary, but to discover whether that was true would have required the injection of facts into what was an almost fact-free evening. The petitioner was asked what tangible benefits would be seen if the boundary were to be changed – even though this is not a criterion for judging whether it should be moved. He related the trouble some businesses have with deliveries, where lorry drivers first go to Over, then start looking for the business park. There is a business park in Over, so they drive around there for a while and eventually give up and phone. The Councillors then became obsessed with SatNavs and postcodes, speculating on whether deliveries really would get lost – despite having just been told that they did. An anecdote about a villager who regularly misses having her bin collected was related. Her Councillor always tells her to ring the relevant department, and the first thing they ask for is the postcode, thus intending to emphasise the postcode’s importance but entirely failing to see that even with it she was not getting her bins emptied. Another proposed benefit was that building a footpath to the business park might be possible. This was dismissed as “pie in the sky” by the Over representative because nobody would fund a footpath which was 1.25 miles long. A footpath to Willingham would be 75 metres. Several Councillors expressed themselves “unable to grasp the concept” that all that would be achieved was the moving of a line on a map. This is entirely the point, despite another claim that to change the boundary would in effect be a “land grab;” no land ownership is in any way affected by parish boundaries. It may be my political naïveté, but there appeared to be an unspoken commitment amongst the objecting Councillors (by no means all Conservative) that “nothing must change.” Ever. How did it end? Astonishingly, with a compromise: the decision was deferred for 4 weeks so that Willingham and Over Parish Councils can meet and agree a way forward. It has taken an alarming amount of time and effort to get to what should have been the starting point. It has also shown me that logic, reason and plain-speaking are strangers to local politics, and I can only thank my lucky stars that most of these meetings take place when I am at work and therefore cannot attend. Published on 2013-11-23 in journal and willingham. The neighbours seem particularly allergic to the leaves from our tree, so we have to get it cut every now and then just to keep everybody happy. Except me, because now the ridiculously bright new street light prevents me from seeing any stars at all from the garden. It was advertised, before they installed it, as being turned down at night – but it blazes away like a full moon after the sun has gone nova. I miss the Milky Way. Published on 2011-05-24 in media and willingham. Further embedding myself in Cameron’s BS, I am now on the editorial team of the Willingham Life website, nominally in charge of the photographic content.